We are excited to launch the public preview of the Data Gateway feature on the Power platform admin center; This feature provides tenant admins with visibility into all On-premises data gateways within their organization and also management capabilities. Once you log in as a tenant admin, click on Data Gateway on the left in the Power platform Admin center. Note: On-premises data gateway(personal mode) and gateways outside of your Power BI tenant region are currently not included. This helps the tenant admin see gateway members in each gateway cluster. Clicking on the next to the Gateway cluster name display the gateway members. The detail includes the gateway member device name and the version of gateway on the device. Alternatively, you can also invoke this by selecting the gateway cluster and clicking on Open Gateways at the top. 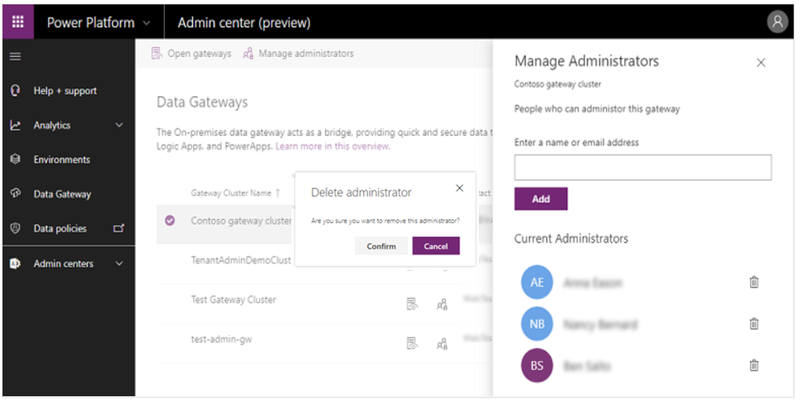 Tenant admins can now add and remove gateway admins. Click on the icon for the gateway cluster. This will show the list of gateway admins. Alternatively, you can also do this by selecting the gateway cluster and clicking on Manage administrators at the top. The tenant admin can then add gateway admins by typing the name or email in the text box and clicking on Add. Similarly, tenant admins can also remove gateway admins. To do that, you would click on the icon next to the gateway admin of the gateway cluster in question. Clicking on Confirm below would remove the user from the list of gateway administrators. Tenant admins can also use the Search option on the Gateway cluster name and Contact info. In the example below, it is showing gateway clusters with “contoso” in its name. As always, we would love to hear more from you, learn from your experience and improve based on your feedback. Thank You!